General Bikram Singh, Former Chief of Staff of the Indian Army, visited IIM Indore on October 10, 2016 to deliver a talk on ‘Leadership Lessons from the Army’. During his eventful and distinguished military career of over 42 years, he has held a number of key positions including Chairman of the Indian Chiefs of Staff, Chief of the Eastern Command, and has served in 2 UN missions in Central America. Besides his expertise in the aforementioned fields, he is globally admired for his astute strategic leadership. 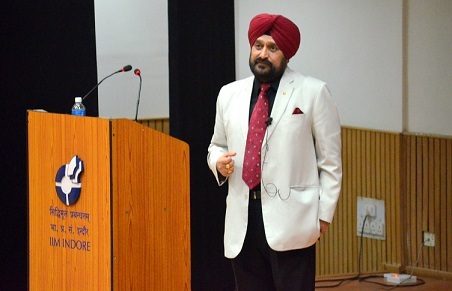 Through a course of a highly interactive session, General Bikram Singh enlightened all the attendees, students and faculty, about the two pillars of a leader – character and competence. Speaking of the physical, mental and emotional attribute a leader must possess, General Singh spoke about endurance, stamina, will power, calmness, composure, and confidence among various other attributes of a successful leader. Giving an example of the seven values of the Indian Army – loyalty, integrity, duty, respect, selfless service, courage and honor, he explained the importance of aligning oneself wholly with the values of the organization in which one works. General Singh also spoke about the technical, tactical, conceptual, and interpersonal competencies required in all leaders. Elaborating on his takeaway as a strategic leader of the Indian Army, General Singh mentioned a few tenets, which act as success keys to leadership effectiveness. The first was building, enhancing, and repairing trust where he spoke about the essence of moving from being a nominated leader to being an accepted leader by making oneself a trusted brand. He then went on to speak about the need for creating the right kind of climate for one’s subordinates as a leader, a climate that would strengthen the organization’s culture. On the softer side, General Bikram Singh said that it is absolutely necessary to balance one’s passion and love (family) to become a well-rounded personality. He also spoke about the importance of humility, taking the bricks and passing on the bouquets, and leading change through envisioning it. 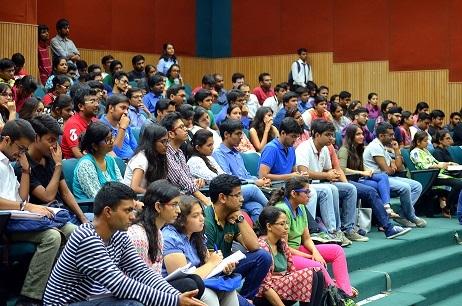 The session ended in a Q&A round with the students of the institute where General Singh answered curious students’ questions ranging from Indian Army to questions about management and leadership, thus making it a unique opportunity for all attendees to get up, close and personal with the distinguished guest. Witnessing high levels of participation, it was an insightful experience for all attendees who learned to look at leadership from a very different but robust perspective.